Trains are a convenient mode of short, medium and long distance travel across Europe. For short distances, they are fast, reliable and frequent. For longer distances they can be preferable to flying for several reasons. Trains have more spacious and comfortable interiors, may offer scenic routes, and do not require long waits at security like at airports. They usually run more frequently as well, and take their travellers to railway stations located in or very close to city centres, whereas airports, especially the ones that budget airliners fly into, can be up to 100 km away from the city centre, requiring expensive and time-consuming connecting services. Ultimately, many people may choose the train over the plane for the feeling of romantic travel they provide. The quality, speed and price of train travel depends on the country, Western European countries generally offering higher speed and more luxury trains at higher prices than Eastern European countries. While discount airfares often suggest otherwise, rail travel is often comparably priced or cheaper than the plane, especially if considering special offers. Train travel is getting faster every year through the construction of new high speed lines which travel up to 300km/h. Germany, France and Italy all have high-speed networks. 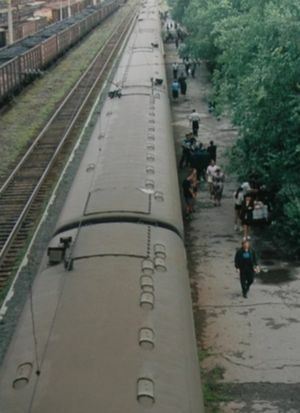 There is a dwindling number of overnight sleeper trains like the Brussels to Warsaw or Munich to Berlin route. Most countries have timetables and travel planners available on the sites of their national railways. The website of the German national railways () has a very convenient route planner that covers all trains across Europe, including occasional trains that travel to Beijing or Pyongyang. Price information is available for train rides which go through Germany only, however: for that information you still need the national websites. Locally, look for the departure timetables posted in the station. Staff at the ticket counter may be able to help you out with planning your trip. The cost of rail travel varies greatly by country, with Eastern European countries often having cheaper offers. Italy is comparatively cheap as well, while the United Kingdom is relatively expensive. Ticket pricing varies widely throughout the continent. Some countries, like Italy, have a pricing that is based on solely on distance with no advantages for booking in advance. Other have an airline-like pricing, with advance bookings being cheaper than travelling on short notice - the Eurostar trains are one example. Still others, like Germany, have "standard" prices but also a variety of discount offers with different requirements and restrictions. International fares may also be available as special offers, and the same train may be available through different railways at a different price. One way to deal with this is to check if you find a specialised rail agency, that does all the booking for you and finds the best prices. Or if booking on your own, you can check out the respective booking sites in advance. When buying tickets online, make sure you can actually get them delivered to you. Many countries have print-at-home tickets, but sometimes tickets need to be picked up at a ticket machine in the issuing country, or need to be mailed within that country. A number of reservation-only trains exist, but in most places seat reservations are optional and usually costs a small fee. Without a reservation you can board the train and use any free seat. A seat is not guaranteed though, and you may end up standing or sitting on the floor for your entire trip. To save money on a multiple destination trip you may want to look into purchasing Inter Rail passes (For Europeans only) or Eurail passes(For non-EU citizens/residents). Note that with these passes, you may still need to reserve seats or sleepers on some trains; on international and high-speed trains, reservations are often obligatory. In eastern European countries Interrail tends to be bad value for money as the local cost of point-to-point tickets is very low. On weekends in Germany get the Schönes Wochenende ticket, which is valid for unlimited travel on all regional (RegionalBahn and RegionalExpress) trains across the country, local public transport in most cities and even a few international trains. The ticket costs just 30 euro's and is valid for groups up to five people. It's a bargain, especially if you can get a group of people together. During weekdays there are similar tickets available, which offer the same unlimited travel but are limited to one Bundesland. If you stay a long time in the Netherlands it might be interesting to get yourself a 40% discount card for 50 euros. It is valid for 1 year and it allows 3 other passengers travelling with you to benefit from the same discount. People who are 25 years old or below can usually obtain some discount off regularly-priced tickets upon presentation of proof of age though a few railway systems require these groups, as well as other groups to purchase a rail card, the cost of which can be recovered after just a few long distance trips. Travelling by train in Europe is usually very safe - much safer than by car in terms of accidents. The main risk for ordinary travellers is pickpocketing and luggage theft. Pickpockets are are mainly a risk in crowded metros and commuter trains; so take the same precautions as in any crowded place: Keep your valuables somewhere safe, and your bags where you can see them. Intercity trains are usually very safe, although you should still store valuables near your seat where you can keep an eye on them. Luggage theft may happen on night trains while people are asleep. Sleeper cars should be relatively safe if the doors are properly locked; but in couchettes the locks may be more rudimentary - or some of your fellow passengers may leave the door unlocked after using the bathroom. If you have valuables, it may be useful to tether them to something with a lock. Train stations often do attract their share of pickpockets and scammers. You should be aware that theft is probably more common at the station than on the actual trains, and people who offer you "services" should be taken with a grain of salt. Even stations which are very nice during business hours can become a bit creepy late at night, when security patrols are less frequent and the homeless or drunks set up camp. If you feel uneasy, head for the official information counter or the nearest staff. That said, stations vary greatly throughout Europe and range from spotless, futuristic and super-safe places to somewhat seedy. Violent crimes on trains, or in stations, are sometimes reported in the media. These usually involve young people on metros, suburban or local trains, but keep in mind that these are usually isolated incidents. If you witness potential trouble, use the emergency button to alert the driver or staff, instead of getting involved yourself. Thalys  -Services between Paris, Brussels, Cologne and Amsterdam. CNL  -(CityNightLine) Night trains from Zürich to Amsterdam, Hamburg, Copenhagen, Rostock, Berlin and Dresden. Also from Dortmund to Vienna. Cisalpino -High speed trains between Italy, Switzerland and Germany. EuroCity Standard term for international InterCity trains conforming to certain quality standards. Trans-Manchurian Travels from Moscow to Beijing, China. Trans-Mongolian Travels from Moscow to Beijing via Ulaan Baatar, Mongolia. Trans-Siberian train in Russia. This photo was taken by JanSlupski. Many ordinary lines through the alps in Switzerland are stunning and cost nothing extra. The West Highland Railway from Glasgow to Oban and Mallaig - operated by ScotRail - through west Scotland was voted the most scenic railway line in the world in 2009. Twice a day in summer, a steam train - the Jacobite - travels on part of this route. Trans-Manchurian See international routes section. Trans-Mongolian See international routes section. Venice Simplon Orient Express  Is a new take on the tradition of the famous Orient Express route that began operating in 1883 and with the last of the true Orient Express brand ceasing operation in 1962. The operation runs from March to November and stops at eight major destinations - London, Paris, Rome, Venice, Vienna, Prague, Budapest, and Istanbul. Prices for the route from Paris - Instanbul for the 6 day/ 5 night journey are over £4,000. Société National des Chemins de fer Français (SNCF) France. Trenitalia or FS (Ferrovie dello Stato) Italy. Red Nacional de Ferrocarriles Españoles (RENFE) Spain. Nationale Maatschappij der Belgische Spoorwegen / Société National des Chemins de fer Belges (NMBS / SNCB) Belgium. Österreichische Bundesbahnen (ÖBB ) Austria. Schweizerische Bundesbahnen / Chemins de Fer Fédéraux Suisses / Ferrovie Federale Svizzere (SBB / CFF / FFS) Switzerland. Iarnród Éireann (Irish Rail) Ireland. České dráhy (CD) Czech Republic. Caile Ferate Romane (CFR) Romania. Russian Railways (RZD) Russia. Note, Poezda Net is the official timetable (available in English) for whole CIS. Comboios de Portugal (CP) Portugal. Železničná spoločnosť Slovensko (ŽSR) Slovakia.